Planning to upgrade to your recruiting, hiring and onboarding process in 2019? Learn about iRecruit, applicant tracking and recruiting software, by attending an iRecruit demo this month! 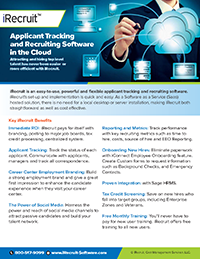 iRecruit offers a cloud-based applicant tracking (ATS), and electronic onboarding system. iRecruit is flexible, and you can select only the options you need! With options for Express, Professional and Enterprise, you can find a flexible recruiting and onboarding solution that works for your budget, and meets your needs. Plan for 30-45 minutes to go over the options, view the applicant tracking and electronic onboarding software, and ask any questions you have. Learn how to take back control of your candidate volume, search and select the right candidate for the job while tracking all candidates through your hiring steps and communicating along the way! See how efficient it is to onboard with electronic onboarding. Download iRecruit’s Applicant Tracking Software Comparison Checklist – it’s free and you can use it with any software you demo. This entry was posted in Blog, iRecruit Blog and tagged applicant tracking software, ats, demo, iRecruit, onboarding software, recruiting software, webinar. Bookmark the permalink.